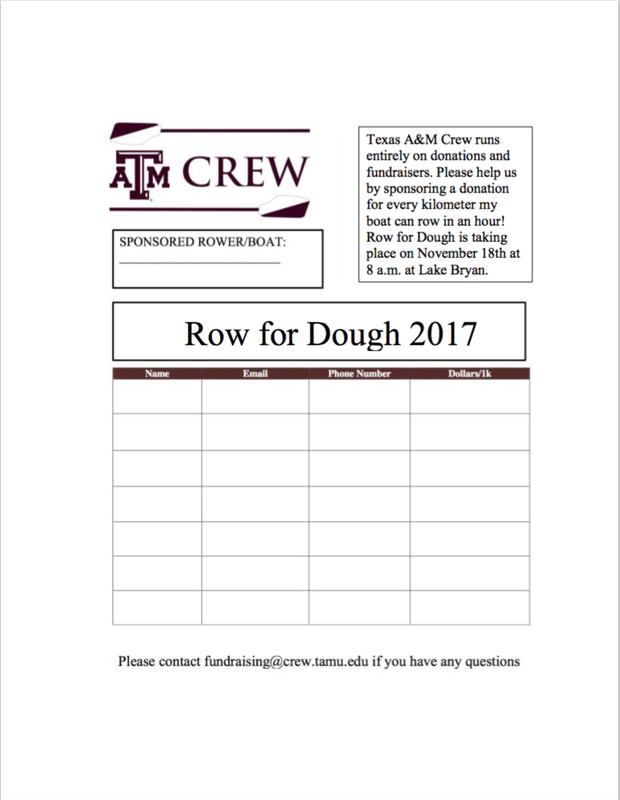 This fall, Texas A&M Crew is hosting their Row for Dough event, their main fundraiser for the semester. In this event, the team will be put into their racing lineups and row for 60 minutes. This year, Row for Dough is Saturday, November 18th. Parents, donors and companies will choose a boat or rower to sponsor with a money pledge per one kilometer that that rower or boat completes in the 60-minute timeframe. Most crew boats will complete about 10-12 kilometers in one hour, depending on their speed. This is a great opportunity for parents, alumni and friends to show their support for the team! Texas A&M Crew is entirely supported through funds from team membership dues and donations. Our plan for the upcoming year is to raise enough money to do serious repairs on one of our eights, as well as do various repairs on other older boats, their equipment, and our boathouse. With our hard-working team, having as many boats up and running as possible is essential to the development, growth, and competitive abilities of the group. If you are interested in pledging money to this fundraiser, please send an email to: fundraising@crew.tamu.edu with 1) the name of the rower or the boat you want to sponsor, 2) how much money you are willing to pledge per 1k completed, 3) how you plan on paying (cash or check). Thank you so much for being part of the Texas A&M Crew family!